Attorney Meredith V. Clark, founder of Meredith Clark Law, has chosen to focus her firm on family law conflicts. This choice of practice concentration is related to a principle that Ms. Clark learned as she was raised in a family steeped in Texas legal tradition: The law exists to protect individuals and their families. Perhaps nowhere else in our legal system is it more apparent when this principle is disregarded than in family law. Our firm is dedicated to helping you resolve your divorce and other family law litigation matters quickly, efficiently and with beneficial results for you. Ending a marriage can seem legally intimidating. There are many aspects of dissolving your relationship, just as there would be if you were dissolving a business partnership. However, in divorce proceedings, feelings of grief and anger can cloud rational consideration of what is best for each spouse and their children. When you visit our Houston office for the first time, Ms. Clark will ask you about your current situation and your goals for your post-divorce life. She will use this information to craft a litigation plan that will address your needs and answer challenges that the other side’s counsel may employ. Our firm focuses specifically on assisting clients who must go to court to resolve their divorce case. When that is the case, Ms. Clark applies her broad base of civil litigation courtroom experience to fight aggressively on her client’s behalf. 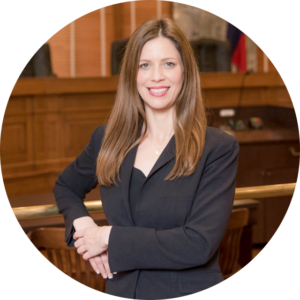 She is known for a courtroom presence that can match that of a big-firm attorney because that is her professional background. She is well-versed in how to handle all phases of civil trials and is ready to stand up for your rights, no matter how contentious the situation. Our goal in family law is to fight for the best interests of your family. To set up an introductory appointment with our founding lawyer, use our online contact form.